And really, aren’t they one and the same when you think about it? A birthday is just celebrating the anniversary of your birth after all. 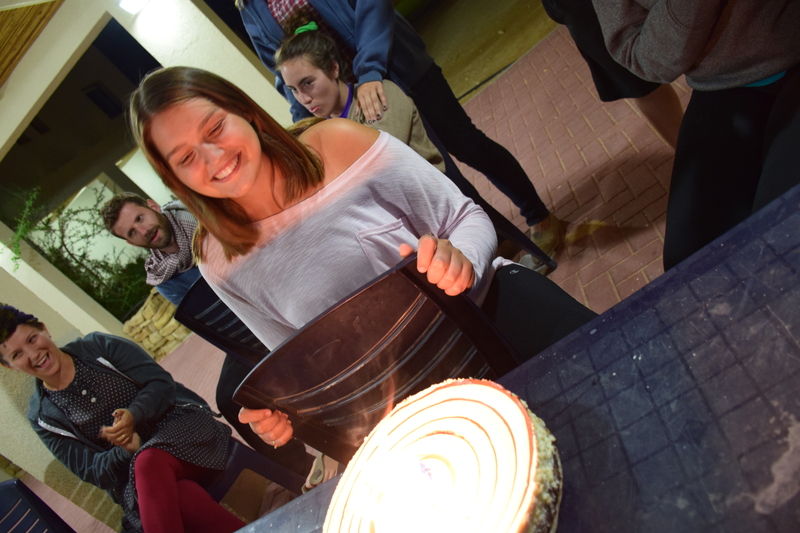 I mentioned before that the last day of our Negev Trip was on my birthday, but since the blog post ended there, I didn’t get to talk about the marvelous birthday party my friends threw for me the next day! After we all recovered a little from the Negev Trip, one of the PAs baked a beautiful chocolate and vanilla swirl cheesecake, we all gathered around it and they happily sang me the Happy Birthday song in as many languages as we had present, well almost, we didn’t get to hear it sung in Polish but I was serenaded in English, Hebrew, Arabic, French and Spanish. Then my friends all gathered around the chair, lifted me up and bounced me twenty one times as punish–sorry–as a reward for turning twenty one. The first about 11 bounces were terrifying but after I realized that I wasn’t going to fly out of the chair I had a total blast. Unfortunately I don’t think the Tower of Terror will ever scare me again. Between the hike down the Mizpe Ramon Crater and the birthday party my friends threw me, my twenty first birthday, unlike so many other Americans’ twenty-first birthdays, will be one I remember for a long time. I know you’re all curious about my classes since I never mention them, but I never mention them because there isn’t much to say. They are similar to classes I would take at UCI, except the class size is much, much smaller, the professors (for the most part) are much, much cooler, and – because this is a semester system – times moves much, much slower. We did have a pretty cool field trip in Sustainable Agriculture so I thought I’d tell y’all about our trip to the date fields. The kibbutz has two main areas of income. The algae factory, which I’m sure I’ll talk about some other time, and the date farm across the street. There are two types of dates grown there and a mix of volunteers and paid workers work in the field year-round. The date palms were planted by our Sustainable Agriculture teacher about 30 years ago when she first came to work on the kibbutz. They planted the male trees on one end of the orchard and the rest are all female trees, this requires hand pollination by the workers but produces the greatest yield from the date palms. As we walked along I saw these signs (the one on the rights says “Attention Animals May Bite”) which I thought was left over from when maybe the kibbutz had other animals out here but lo and behold! A donkey! I even got to hear him hee-haw and man it sounds nothing like I imagined! The kibbutz never had any other animals out here, the sign was about the donkeys–just so we’re clear. Behind the date orchard was our teacher’s pet project: another orchard with all sorts of trees that she has been domesticating to produce more fruit, or tolerate salinity, or some other cool feature. She’s trying to introduce the marula as the next big crop in Israel because the trees grow well here. I tried one at her office once, it was a little bitter for my taste. In addition to her orchard in the back, she has a huge tree nursery that we got to hang out in as she told us about her work domesticating the marula. She’s working with a group that wants to plant like eight thousand of them so they spent the whole summer making those and now she needs twenty thousand more for a different order! Today and tomorrow are the 41st Anniversary celebrations for the kibbutz, I was inspired to write this tonight so the celebration photos will be split between blog posts and my #datkibbutzlyfe on the anniversary will probably have to wait until the next blog post as it’s more relevant to tomorrow’s excitement. However, tonight was a fun night as well! The dining hall made us a slightly nicer dinner than usual, an asian stir-fry type meal and we had tablecloths on all of the tables. After dinner, we all gathered around the merkaz (usually our classroom but also the community center, synagogue and stage) and presentations were given celebrating the kibbutz. Many of the children, divided by age had put together songs to sing or dances to perform. The little girl in the center of this photo (white shirt) is my host-family-little sister. She’s eight years old and understands english but is hesitant to speak it. Her and the other kids her age plus those a little older (I think about 8-12 was the age range) put together a pretty awesome dance routine to a song in hebrew. After the speeches and dances were finished, traditional Jewish music was played and one of the community members started leading people in community dances. Luckily the dances are pretty easy to pick up/follow along and no one minds if we jump in and dance with them. So I tend to jump in and give it a try every time they start dancing in circles. #datkibbutzlife: I think every coach, teacher or mentor has told their pupils to “learn from their mistakes” at least once, meaning, of course, that next time they should do things differently so they don’t put themselves in whatever their current situation is. While that is sage advice, it gives mistakes a very negative connotation, which is such a shame because so many good things can come from mistakes that it’s important to learn to be brave enough to mistakes and see what happens. For instance, learning how to not get yourself into a bad situation is important. Learning how to think on your feet and deal with mistakes as they happen is also an important lesson, but you’re going to end up in a bad situation at some point and it’s better to learn how to manage the situation than freeze up and panic. Story time! Occasionally, during winter, it rains here on the Kibbutz, there’s lots of wind, thunder, lightning, all the makings of a good storm but not all that much water falls from the clouds (we are in the desert after all and when I say we get 20 mm of rain a year that’s not a typo). So the storms are actually quite fun, when we went on our overnight hike the lightning lasted for hours while the rain only lasted for thirty or so minutes. So when it had lightly rained in the morning and the thunder and lightning had stopped by lunch I felt perfectly at ease going for a hike up Arch Zula canyon to go explore the upper plateau some more. What better weather could I ask for? It wasn’t too hot, still somewhat cloudy, and pretty windy, so I stayed cool. It was a familiar route so I climbed to the top quickly, and as I climbed over the last shelf and sat down to have some water, lightning flashed over my head and was followed two seconds later by thunder. This was a rather dangerous place to be, on top of a totally flat mesa, no shelter over my head, no nearby trees and lightning right above me. I stopped to think about what I should do, waiting to see if the storm might just go away, maybe that was an errant strike? But obviously, that’s not how things work and that was simply wishful thinking. The next lightning bolt and thunder clap occurred almost simultaneously sending me running down a little ways underneath a couple of rocks, providing me with a little more shelter. I had about thirty seconds between lightning strikes and, so far, none had been ground strikes. I realized that the zula was about halfway down the canyon beneath me and would provide a good amount of shelter while I waited for the storm to pass, so, after the next lightning bolt I left my little shelter and started booking it down the mountain to the zula. I made it safely and spent a pleasant forty five minutes reading a book in the zula as I listened to the thunder overhead. So I definitely learned not to go out hiking when there are still thunderheads in the sky. But I also learned how to stop and think in the middle of a somewhat dangerous situation rather than panicking, a somewhat useful skill. In addition to both of these, I now have a fun story to tell (my definition of fun perhaps being a little different from my parent’s definition)! Note: This fun little excursion into the mountains happened a few weeks ago but I’ve been waiting for the right moment to tell the story. Now, two months into the program, I figure is as good a time as ever to start talking about all of the nonacademic lessons I’ve learned.